2.5 StarsThe more I've thought about this book, the less I've liked it. 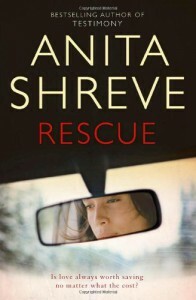 When I finished it the other day, I rated Rescue three stars on Goodreads. Since I've finished it, I've just got irrationally annoyed by an awful lot of the book. It's a shame, because I think the synopsis on the novel had potential, even if it was incredibly misleading as to what actually happens in the novel. I'll say now that there will be minor spoilers in this review.My real problem with the novel was that I couldn't work out if Webster was supposed to as unlikeable as I found him. At first he came across as incredibly naive, in fact his character reminded me a fair bit of Gordon in Kate Atkinson's Human Croquet. However, in that novel it was pretty clear that he was not really supposed to be all that sympathetic. In Rescue, I really couldn't tell what Shreve's aim was with him; whether we were purposely supposed to see him as unlikeable or whether he was supposed to actually be a sympathetic character. His actions as the novel progressed really confused me as well; firstly, the fact he told his daughter that her Mum was an alcoholic when she was only eleven seemed a bit weird but most of all, it was the fact that he forced Sheila to leave the state rather than face her drink-driving charge when Rowan was a baby. So, far from 'a mother leaving her family', a mother is pretty much exiled from her family. That scene pretty much removed any kind of care I had for Webster's character.The other main characters were Sheila and Rowan, the estranged wife and daughter of Webster. Rowan was a pretty believable teen, dealing with not having a female figure in her life. Sheila again reminded me of Eliza from Human Croquet, a woman who essentially finds her trapped in a place and a role that she does not really want. Her change later in the novel was pretty nice to see, part of me can't help but think that it's a shame the novel wasn't told from her perspective-I think it would have maybe been a little more interesting.Shreve's writing style is pretty engaging, the novel passed really quickly, so I would guess that with better characters I would probably enjoy her work more. Judging by the other reviews on Goodreads, most fans of her work say that this is their least favourite, so I guess I started reading her with the worst possible one! I think I will probably try so more Shreve at some point, but not until I've made a substantial dent in my TBR pile.